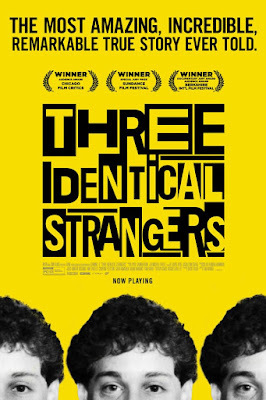 A documentary about three identical triplets who were separated at birth, and neither they or their families were aware of it, until the siblings all accidentally meet at the age of 19. Then they later learn why. The film was directed by Tim Wardle, and it's received nearly unanimous positive reviews from critics. I found it to be extremely intriguing, but it's also highly disturbing. It's a really well made doc! Eddy, David and Robert were three identical triplets who were separated at birth, and put into different families. Neither they or their families knew this, until the three siblings accidentally meet at 19-year-old. They are amazed to learn just how similar they all are, right down to the women they like and their career choices. Their fascinating story becomes a huge news story as well, as the trio tours different talk shows, and then they later learn why this knowledge was kept secret from them (and their families). The triplets were separated as part of a scientific 'nature vs. nurture' twin study, and the results of it are the most fascinating part of the film (and the most disturbing). This is why the movie reconfirmed my beliefs that were socially conditioned to make almost all of the choices we make in life, and how we accept and tolerate others. It's why we believe we need to consume meat and dairy, and it's also why all the same people are perceived to be unattractive, by almost everyone, and vice versa. There's a really established and controlled hierarchy, and everyone has their set place in it. We can break this social conditioning (and go vegan, and learn to find unique looking people beautiful), but it's like breaking an addiction. It takes a lot of conscious effort and determination. That's what this movie reconfirmed in me.